The Dumbarton Bridge is the southernmost of the San Francisco Bay Area toll bridges, and one of two sets of bridges at the south end of San Francisco Bay. The other bridge is the San Mateo-Hayward Bridge. The Dumbarton bridge is part of California's Route 84. The total length of the Dumbarton Bridge is 1.6 miles, although the distance between its east and west intersections, where drivers can get off CA 84, is nearly six miles. Tolls on the Dumbarton Bridge are collected in the westbound direction only, at a toll plaza located just east of the bridge spans, in Newark. The Dumbarton Bridge also has a distinction not shared by other San Francisco Bay Area bridges: Just west of the span can be found the home offices of Facebook, famously located on Hacker Way. ► Starting exit and Mile Marker: University Avenue at Mile Marker 0, in Menlo Park. ► Ending exit and Mile Marker: Thornton Avenue at Mile Marker 5.7, in Newark. Tolls on the Dumbarton Bridge are calculated based on the number of axles for your vehicle. 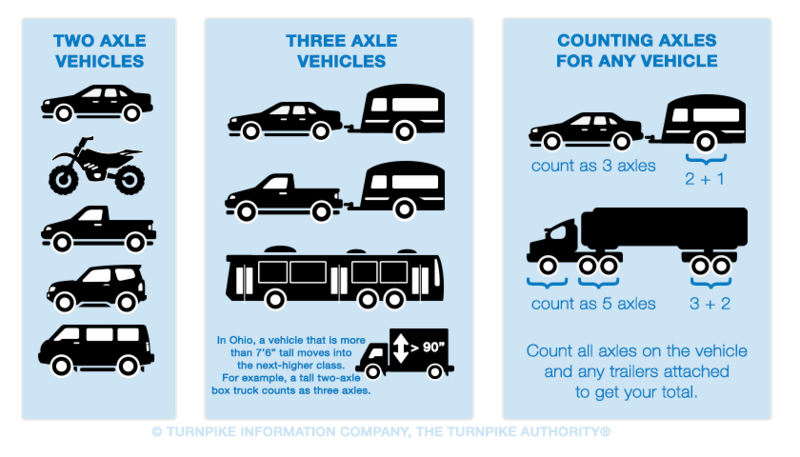 When counting axles, make certain to count the axles with wheels on the ground, including any axles on trailers you may be towing.